Being unable to think with clarity or act with understanding and intelligence. I read with amusement the recent announcement by Misys on how they are “Leading the Industry with Bold Open Source Move.” On first pass, this is a great announcement and the fruition of many people who for many years have been laboring to increase awareness of the potential of open source within the health industry. The announcement was accompanied by the requisite and appropriate platitudes regarding how open source can increase interoperability, enable greater collaboration, and ultimately save the world. I particularly enjoyed the comments from Newt Gingerich (whats the monthly retainer? ), Ron Hovsepian (Novell as the ultimate open source sellout), and Adam Gale (from the bastian of impartiality KLAS). However, a thoroughly review of the announcement reveals the perverse attempt by Misys to land grab on the momentum and marketing behind open source. A deeper review of the press release shows the absolute confusion and gross lack of understanding of Misys regarding Open Source. October 24, 2007. Misys makes the “Hey Look Everybody, We are Open Source” Announcement. That is so 2001. Bold Move. There is no braver move than releasing software that has no market adoption. Congressional Medals of Honors all around, please. No Code. No source code is released or announced as part of the announcement. What? Lame software. The software purported to be released has minimal market adoption. If a tree falls in the forest, does it make any sound? I have written at length about the values of open source previously – Meritocracy, Legitimacy, and Transparency. In this case, Misys fails on all three fronts. Give them some props for even associating with open source, but to make this announcement with no code, no community, and no coherent plan is silly. This desperation move was noted for what it is by Steve Lohr of the New York Times in his Open Software or Forklifts? article. He discussed the potential role of open source, and how this move by Misys was quickly discounted by industry analysts. Bottom line: Misys welcome to the party! Unfortunately, looks like you are a little confused regarding the timing – it began 25 years ago. This entry was posted in Conferences, Open Source, Value. I certainly agree that we can trace the open source roots back to the ‘60s but I also recall when I first joined Watson Research over a decade ago and there was a lot of concern about open source being the demise of our software division. Of course that didn’t happen and IBM and others successfully navigated the OS waters well and became a leader in such initiatives as Eclipse. BUT…the process of accepting the disruption to the business was tantamount to going through Kubler-Ross’ 5 steps of grief. OSI was just becoming active and commercial entities were beginning to understand what was happening to them and why it was important to take an active role. Now that was over ten years ago and it shouldn’t be surprising that healthcare lags most other industries as it relates to technology. 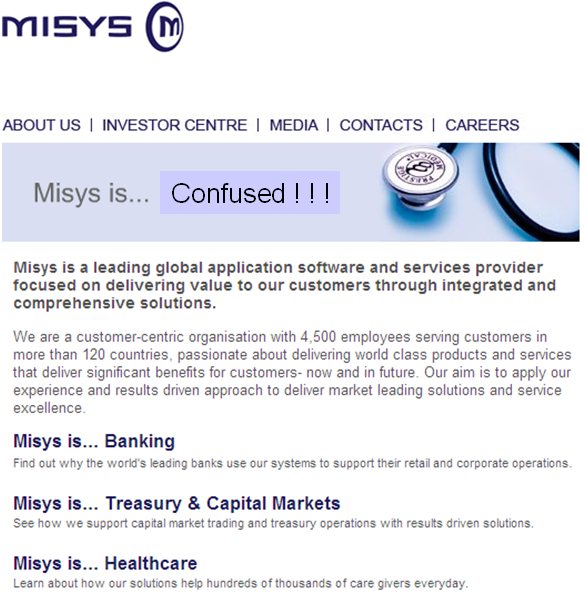 Surprise…Misys is a healthcare company. Although the use of open source isn’t new to us, the act of disclosing previously proprietary code does require the adoption of a new business model and service delivery approaches. The growth of the Internet and the introduction of new disruptive technologies and activities such as SOA, Health 2.0, and SaaS are going to force all ISVs to begin to think and act differently. Until the pain point of interoperability is addressed, it is certain that significant progress will be negatively impacted. We are navigating new waters and are beginning to take the correct steps to support the bold statements that were made in the press releases. In support of “Saydobe” (https://crossoverhealth.wordpress.com/2006/12/06/part-2-open-source-values-meritocracy-transparency-and-legitimacy/), Misys has taken the first step to be transparent. It did so by announcing it would make its code available to the OS community. For the initiated, we’d all have liked to see Misys Connect appear on Sourceforge or Eclipse but frankly, the code isn’t ready for release yet. Some parts of Misys Connect will be redundant to the community given what Mirth and Eclipse OHF have already done. In an attempt to meet the ‘legitimacy’ standard, it is understood that the code that is deposited must have value — so we need to compare our commercial code to what already exists and deposit code that provides incremental value. The componentization and associated documentation will take some time. Misys has taken its responsibilities to the community seriously and has a desire to meet the high standards of relevance that are required. When the code is ready to be dropped, I expect it will be done so in alpha form so the community can comment. Based on the comments we receive, I hope we will move to beta in relatively short order with the expectation that we’d deliver a v.1.0 of an Open Source product once the community has weighed in. This more methodical approach will help Misys operationalize its releases and take the time to learn what the community will expect of us. The most aggressive schedule expects to have code ready for the community to review sometime in February. Meritocracy is based on accountability and Mr. Lawrie has made a commitment to the world that he will support significant contributions to the open source community. Misys will honor that commitment not to make the open source community happy but because it’s the right thing to do. These contributions, in addition to the actual developed code and the creation of a separate open source division inside of Misys that translates into millions of incremental investment dollars are yet in addition to the other $10 million the company had already committed in grants in 2006 to support the creation of key connected communities throughout the US. In short, the Misys announcement is not just about releasing code but is about jump starting its adoption with careful funding. In the spirit of further transparency, let’s discuss why Misys is releasing interoperability code now. Misys has been working on the Connect product for over two years and as some have correctly stated, the product has not gained much traction — yet. The good news is that Connect is a commercially released product, live at 2 customers and V2.0 is in beta and will be implemented in 5 more connected communities when released. However, although our roadmap calls for interconnectivity with others, the current version is limited to a homogenous Misys environment. Interconnectivity between multiple proprietary systems is nontrivial even though HL-7 exists. Although improvements have been made available through Mirth and Eclipse OHF, the industry still has not made significant progress. Over the last decade, while the healthcare industry has languished, the inability of individual provider’s offices to share critical information for referrals or during emergencies has resulted in suboptimal care. The controllable adverse effects associated with providing integrated systems are not readily available and as a result, people are dying. Though that statement is probably not a surprise to anyone reading this, the larger concern is that the actual mortality and morbidity figures associated with this problem is not even measureable today. The technical healthcare community knows how difficult the issue of interconnectivity is and with such a low penetration of EMR systems in the individual provider’s offices, the commercial pie is large enough for all to play. For now and the foreseeable future, Misys will be a hybrid (Open Source and proprietary) software and services company. We understand how this may be an unpopular decision with some members of the Open Source community so we need to be up-front with our intentions. Although the Misys press release was subtle on this point, let me amplify. We don’t differentiate ourselves at the horizontal (integration) layers…differentiation is at the vertical (applications) and service levels. By focusing on the interoperability problem first, our intention is to help proprietary system developers feel comfortable about making their adapters freely available for information exchange to occur. It is our sincere hope that Open Source will be a lightning rod to increase openness in health IT. Only when information is easily and reliably exchanged may we create the network effect we all desire and who knows, the life that we could save, could be our own.